Something slightly different for my latest post but I thought, and hope, you will be sufficiently interested to continue reading. A couple of years ago one of my Walsall Lives calendars found its way to Tasmania, Australia. The recipient was ex-Walsallian, Ken Pomlett who lived with his parents in a house on the corner of Bath Road and Little London before he emigrated to Australia in the 1960s. Ken contacted me to say how much he had enjoyed the calendar which brought back many memories for him of the town he left almost fifty-years ago. Many emails were exchanged between us and in one Ken asked me if I knew of the Walsall in Australia. My first reaction was that he was pulling my leg but to my amazement he wasn’t……there is another Walsall on this planet of ours…..and I don’t mean Worsall in North Yorkshire. 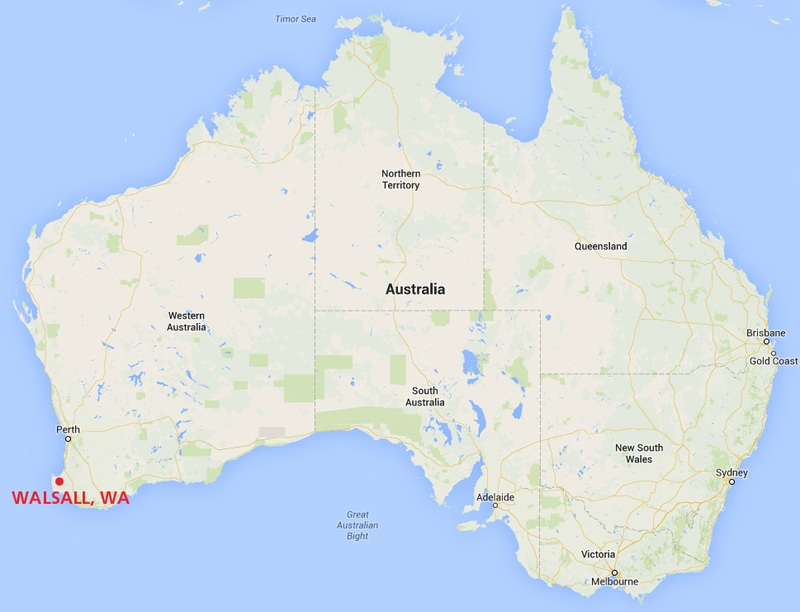 The “other” Walsall is situated in Western Australia approximately one-hundred and fifty miles south of Perth, the nearest town is Bussleton which is on the coast, about twenty miles from Walsall WA. There is no Milton Street, no Littleton Street, not even a Bridge or Park Street, just Jalbarragup Road, Walsall Road and Prater Road…..and that’s it, it really is just a name on a map…..but the weathers good! As for the scenery, well, just miles and miles of nothing. The Walsall in Australia came about in 1925 through the Group Settlement Scheme, the brainchild of an Australian politician named Sir James Mitchell. The ill-fated scheme began in April 1921 and initially targeted families in Australia, but after the signing of the joint-venture Migration Act between the British and West Australian governments, recruiting in Britain began in earnest. The idea was to open up parts of the State previously sparsely populated and turn it into an agricultural area. Advertising in Britain declared “Own your own farm” and the advertisements showed pictures of wide open spaces, tanned, healthy people working the land and making a new life for themselves, but the reality was very much different. The Scheme proved popular to the unsuspecting potential settlers nine-thousand miles away in Blighty and they enrolled in their droves from all over Britain. After a voyage of many weeks the immigrants landed on the quayside in Fremantle and then made their way to the given destination by road and rail in very uncomfortable circumstances. 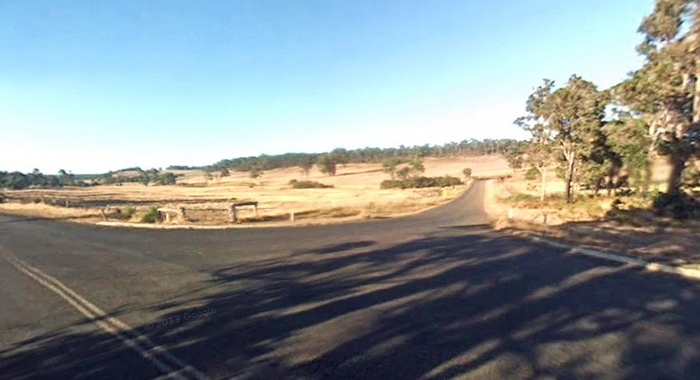 A total of 150 groups were formed with such names as Peel Estate, Busselton, Kudardup, Denmark, Walpole, Manjimup, Nannup and Bridgetown and of course Walsall. Each group consisted of 20 settlers with a foreman who took control over the group. The work was hard in unfamiliar surroundings in baking heat, covered in filth, flies, ants and dust. 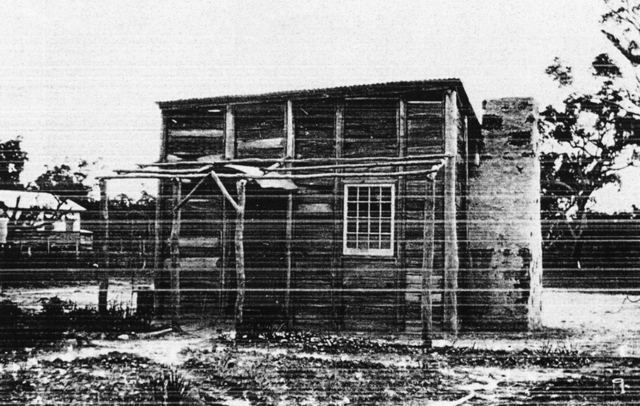 Initially the living accommodation consisted of little more than a corrugated iron shack the locals called humpies, only when the four roomed timber houses were built could the families move from the temporary accommodation. Nowadays the families could have sued for being “mis-sold”, but not back then, “shut up moaning and get on with it you whingeing Poms” was the attitude. Each member then began clearing and fencing the 25 acre plots, they worked for five and half days a week for $6. Once the area where the house and garden were to be built was cleared, contractors moved in to construct the weatherboard timber houses. Each plot could be extended, after the initial 25 acres had been cleared, to 160 acres, but the work was so hard and the land so poor life became extremely difficult, so much so many settlers simply walked away from the project. The plots were free apart from, there is always an apart from, a survey fee and administrative charge of £13, this, added to the costs of the voyage, the house and farming implements, each family incurred a substantial debt. 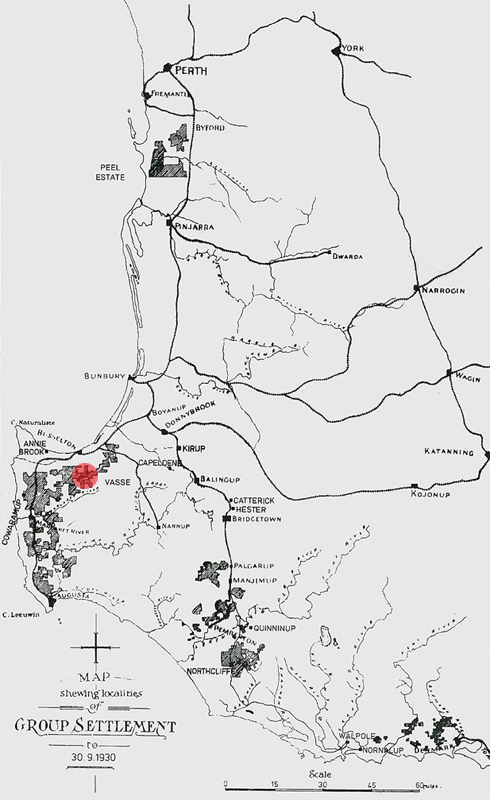 Map showing the group settlements in Western Australia with the approximate location of the Walsall Group identified by the red circle. The scheme had many problems which included personality clashes, hard contracts and the attitude of many settlers and foremen left much to be desired. The pasture land, although good initially, soon deteriorated and the cattle they received were of poor quality. The debts continued to climb and soon the position became untenable except for a lucky few. For many settlers their dream had turned into a nightmare, having given the best part of their lives to the scheme they simply walked away with virtually nothing. The question now arises, why was Group 124 called Walsall? The name for each group was determined by the settlers themselves, a ballot was held and whoever won was allowed to name their group, usually after the place they originated from in Britain. A simple enough system you may think, problem was, there was no one ever listed as living at Group 124 who originated from Walsall, Staffs. During the period from 1925 to 1930 over thirty-seven families settled at Group 124, Walsall and of those only five families came from the Midlands, two from Bilston and Birmingham and one from Lichfield. The Busselton Historical Society (Australia) has copies of letters written by ex-pupils from the school and one comment made me smile as the writer quite innocently stated “settlers by the name of Clark had come from Birmingham, and Walsall is in that county”. Even the Aussies think we are Brummies……and people from Bilston apparently! The Clark family mentioned previously came from Chapel Street, Bilston, and consisted of Joseph Thomas Clark, a brass dresser, his wife Alice and their seven children. The Clarks set sail from London on the SS Demosthenes on 26th April 1924, on the same ship were two women from Palfrey, both named Mayo and travelling with their young children but without their spouses who had possibly gone out first. The two women were sisters-in-law, Elsie Mayo, wife of William Joseph of 139 Milton Street and Alice, wife of Christopher, William’s brother who lived at the back of 94 Cobden Street. Research has shown that neither of these two families, although involved with the Group Settlement Scheme, had anything to do with Group 124 Walsall. Also on board the Demosthenes were Arthur J. Corns from Brownhills and Harry Turpin from Walsall Road, Willenhall, as well as families from Smethwick and Birmingham but again, none of these were associated with the Walsall group and all lived in other settlements. In 1926 Arthur Glassby, a 33 year old miner from Tamworth Road, Lichfield, travelled to Australia on the SS Moreton Bay with his wife and three children, and he is the only one who actually ever lived at the Walsall settlement but by the time he moved there the group was already named Walsall. It remains a mystery as who was directly responsible for naming the group but obviously one of the families mentioned above possibly had some involvement in the process with Glassby being the favourite although the dates don’t coincide. The two ships that took the Mayo, Turpin, Corns and Glassby families to Australia. There are some interesting tales written by ex-pupils about their time at the school, one is asked about the toilet facilities and answers “what toilet facilities?” The water supply was rain water collected in a large tank, as the summers were invariably very hot the tank ran dry so water was obtained from a spring in the swamp. One ex-pupil says during her time there the majority of the children walked to school through all weathers except for two boys who rode 10-15 miles each day on horses. An outbreak of whooping-cough occurred in the mid-twenties and several pupils became very ill with it. It was thought one of the teachers, Les Veall, had brought it to the school from the town where he lived (possibly Busselton). The popular playground game was rounders until as one old pupil puts it “until the English kids came out, and then we played soccer quite a bit”, actually son, it’s football! The isolation even got to the teachers, one chap named Biggins could stand it no more and did a runner at Christmas time, leaving a note that said “would be no more”. Staff and parents were concerned for his welfare (doesn’t mention what the kids thought!) but he was okay physically he had just “gone out East”. Presumably by that they meant he had gone to the opposite side of Australia, as far away as he could get. An ex-pupil’s rough drawing of how each individual group was laid out. 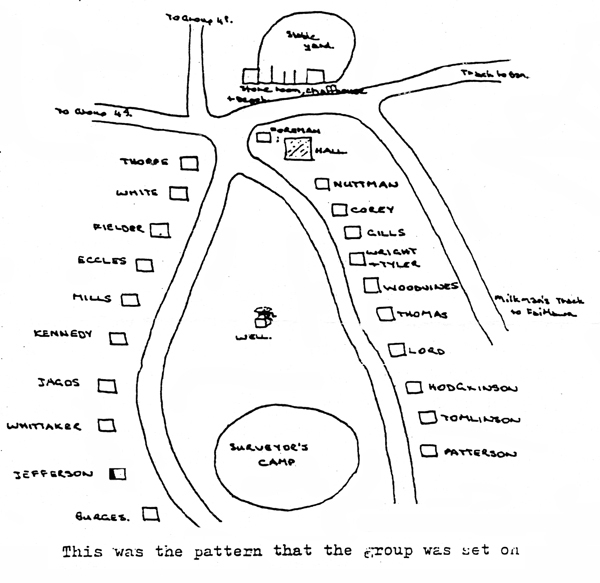 The drawing above, although not of the Group 124 Walsall, shows how the groups were laid out and 124 would have been similar to this. The circle at the top of the drawing was where the stable yard, store-room and chaff house were situated. In the middle, above the surveyor’s camp was the well where all of the settlers took their water from. A far cry from a life in Palfrey, The Butts or Caldmore, these brave settlers took their chance, for some the grass really was that much greener whilst others wished they had never heard, let alone seen the back of beyond and yearned to be back in the “real” Walsall…..as strange as that may seem! “Perhaps Palfrey ay’ that bad after all cocka”. § 2 Responses to Another Walsall! Thank you for this, really interesting. I came to Sydney and came from Walsall where my family still lived and we have been around the Walsall , Birmingham , Lichfield area for over 200 years . Never knew there was a Walsall in Australia . My family name was Gee. I shall have mentioned I came here in 1974 fir a year and am still here! You are currently reading Another Walsall! at Walsall Life.